I'm not sure how routine it is to have a team of archaeologists working alongside a construction crew, but in a historically rich city like London, it may be rather common. 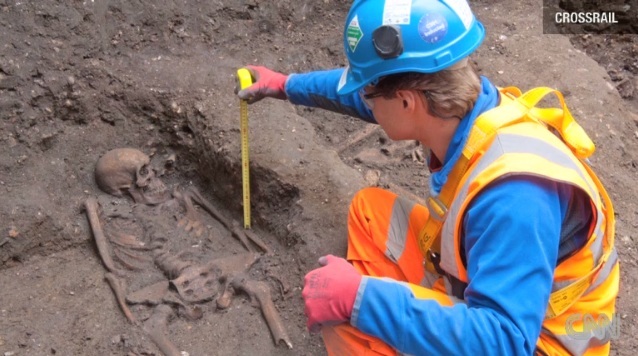 Last month, during the excavation of a new railway station, archaeologists uncovered what is believed to be a mass grave for victims of bubonic plague, known during medieval times as the Black Death. Here's something I didn't know. Each year, the U.S. sees about 10 to 20 cases of the plague from flea or rodent bites, and most of those are from infected prairie dogs in rural southwestern areas. The death rate is around one in seven. Sorry, I meant "weren't" careful. I suppose I'd better stay away from trains.